Man has been fascinated by big cats for as long as we even knew they existed. But getting close to them safely was always a challenge, and being able to record them in their natural environment without alerting them to the camera, or making them flee was always a difficult challenge. As technology has developed over the years some of those problems have gone away, but there is always an interest in getting closer and trying different things, in order to capture the best pictures. 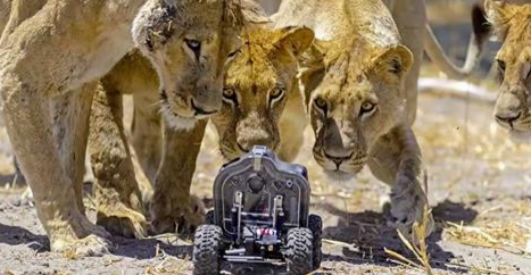 The solution for this video was to attach a camera to a remote controlled car in effect, allowing the photographer to get up close and personal with the beautiful beasts whilst keeping himself very much safe and sound outside the enclosure. The thing that makes this even more special is that the moving device actually intrigues the big cats, and they end up coming right up to the camera and looking straight down the lens. This, of course, generates extra special opportunities for really special photos to be taken. Watch the video below and marvel at the skills of the cameraman as well as the wonderful big cats and their inquisitive nature. Once again these animals demonstrate how alike they are to our domesticated cats, they just adore investigating.